Festivals, Happy Hour, Live Music, Theatre, and More! It doesn’t matter what your interests are or who you’re in the Finger Lakes with, you can always find a great event to enrich your time in the region with those you care about. Events take place all year round in the Finger Lakes region. From lakeside (and on the lake) events in the summer to harvest activities in the fall, snowmobiling or snowshoeing in the winter, and festivals in the springtime! Step inside a glassmaker’s studio to blow your own glass, stroll Main Street on a food tour, or gather for live music and theater performances. Browse the list of Finger Lakes events below or search the specific dates you will be visiting to see everything going on in the region. Below, you will find dozens of great events happening throughout the year with many of them happening annually. If you have memories of favorite annual Finger Lakes events from childhood such as cardboard boat regattas, hot air balloon festivals, cheese, apple or pumpkin festivals, to name a few, it’s likely that event that still takes place or, has likely improved your enjoyment. If you see a special event that piques your interest but can’t make it, click on the event anyway, it might be coming back next year! Make sure to check back frequently to see if any other great events have been added. Events are added daily by businesses from every sector and interest so if there is nothing that sparks your interest now, there very well could be soon! April 7, 13, 14, and 20 | 9 a.m. and 11 a.m.
Come visit the Easter Bunny at the zoo and enjoy a fun-filled morning of delicious food and activities. Bring your camera for a photo with our special guest! Ticket includes post-breakfast zoo admission. Add a one-of-a-kind memory to your holiday with a Make Your Own Glass experience. Victorian-style Christmas ornaments, Christmas tree and snowmen sculptures help to make the season and your home bright. Or wear your holiday cheer with a snowman pendant. Our dazzling 14-foot tree is decorated with hundreds of handmade glass ornaments—the perfect backdrop for your family holiday picture! On view November 12, 2018, through January 2, 2019. Inspired by the warmth and kinship shared at tables throughout the holiday season, the glass holiday feast, created by the Hot Glass Show team, features meal staples like turkey, ham, mashed potatoes, and green beans. Each year the feast grows as gaffers create and bring their favorite dishes to the table. Bring the family for an affordable day out at the Museum. Admission for area residents (living in ZIP codes beginning with 148, 149, or 169) is just $9 December 22 through January 2, and kids and teens, 17 and under are free. Experience special Hot Glass Demonstrations and more. A new crowdsourced exhibit, Growing Up In Geneva, is now on display at the Geneva Historical Society. The topic was chosen through a survey distributed on the Historical Society's Facebook page and email list. The topic choices were: Growing up in Geneva, Crafts and Hobbies, Coming Home (military personnel returning home), Drinking in Geneva (locally-made beverages), and Celebrities in Geneva. The clear winner was Growing Up In Geneva. The Growing Up In Geneva exhibit features images from our collection captioned with comments posted on our Facebook page. The memories include area restaurants, bakeries, and dairies, as well as recreation spots, schools, and influential figures in the community. Stop by to see if you recall the same places and things in Geneva’s past. Growing Up In Geneva will be on display through January 2019. The Geneva History Museum is located at 543 South Main Street. Winter hours are Tuesday through Friday, 9:30 a.m. to 4:30 p.m. and Saturdays 1:30 to 4:30 p.m. Admission is a suggested donation of $3. Parking is available on the street or in the lot at Trinity Episcopal Church. For more information call the Historical Society at 315-789-5151. This yearly exhibit celebrates the holidays and the Erie Canal with dozens of creations made from edible ingredients, submitted by families, groups, children, seniors and businesses throughout the region. Admission is $7 for adults, $5 for seniors, $2 for children 12 and under, and free for Erie Canal Museum members. Open 10 a.m.-5 p.m. daily from November 19, 2018-January 6, 2019. Closed Thanksgiving, Christmas and New Year's days; closed at 2 p.m. December 24 and 31. New Year's Eve Celebration at Finger Lakes Gaming & Racetrack! Join the party at Finger Lakes Gaming & Racetrack as we usher in 2019! Champagne Buffet at our award-winning Vineyard Buffet, 3-10pm. Only $27.95 with Lucky North Card. Live Music from Flint Creek, 8:30pm to 12:30am at our newly-expanded Remedy Bar & Lounge. $2,019 Cash Drawing at 12:30am! Champagne Brunch, 11am-3pm. Only $16.95 with Lucky North Card. Find out more at our website or visit us on Facebook. Parents and children are invited to ring in 2019 together this year at The New Year’s Eve Family Bash! Located in the heart of downtown Corning on Market Street, The Radisson looks to be the epicenter of fun in the Finger Lakes region for all ages on December 31st. Packages starting at only $159! Families of up to five people will receive one deluxe overnight guestroom with full breakfast included and admission to The New Year’s Eve Family Bash featuring exciting children's activities and contests, dancing and music by Prestige Worldwide Entertainment, special performances by Magical John, a private teen’s only club, an all-you(th)-can-eat buffet, an early countdown and more! Ring in 2019 with your special someone at the Inn at Glenora Wine Cellars and Veraisons Restaurant! Our New Year's Eve package includes a variety of elements perfect for a romantic and relaxing celebration, with additional add-ons available to make it extra special. Overnight stay includes a bottle of Glenora Brut and champagne flutes, late night cocktail hour with heavy hors d’oeuvres, sparkling wine toast at midnight, and a breakfast buffet and late check-out on New Year’s Day. Room rates start at $269. Call 800.243.5513 for reservations. Learn more at Glenora.com/Inn/New-Years-Eve! Help us ring in the New Year by joining us on December 31, 2018 at the Holiday Inn Elmira Riverview. It is certainly going to be the biggest New Year's Eve Bash around! Priced at $250.00 per couple including tax (gratuity not included), you can't beat the value of our New Year's Eve Party! Change it up - Enjoy A Walk on the Wildside at Anthony's Lounge inside the Holiday Inn Elmira for a Wild New Year! Party Responsibly! Ask about our Special NYE Overnight Room Rates. Finger Lakes State Parks Invite You to Kick Off 2019 with a FIRST DAY HIKE! Kick off the New Year in the outdoors with a First Day Hike on January 1, 2019! Join one of the more than 75 sponsored hikes being held at state parks, historic sites, wildlife areas and trails across the Empire State. The guided hikes are being hosted by New York State Parks and the state Department of Environmental Conservation (DEC) as part of the 8th annual First Day Hikes program taking place throughout the nation. In NY, First Day Hikes are being offered at 51 state parks and historic sites (with some facilities offering multiple hikes for different age groups, skill level and destinations within the park) and 19 DEC wildlife areas, trails and environmental educations centers. Staff from State Parks and DEC, along with volunteers at many sites, will lead these family-friendly walks and hikes, which range from one to five miles depending on the location and conditions. A sample of this year’s programs include a seal walk, a walking history tour, a snowshoe waterfall hike, pet-friendly treks, gorge walks, military musicology, canal towpath walk, and more. New entries for 2019 include hikes along Lake Ontario, Delta Lake, and Lake Champlain, and recently added trails at Overlook Mountain in Woodstock. If weather conditions permit, some First Day Hikes may include snowshoeing or cross-country skiing. The map below includes the full event locations and details. Many of the hikes are also featured in our First Day Hikes event list. Many host parks require pre-registration so call ahead. And if you attend, be sure to tag us on social #nystateparks. Join us for Fireside Tastings on Friday afternoons! All during January, we'll be hosting "Fireside Fridays" at 3:00 pm, featuring selected samples of our estate wines artfully paired with tidbits of locally sourced cheeses and charcuterie. Each tasting session will be guided by one of our informative, professional staff and will expand your knowledge of Finger Lakes grapes and wines. Find out in depth information about our wines, our vineyards, and our history as you enjoy a warm fire and our amazing lake view. Tickets are required, and can be purchased on our website. Tastings are limited to a maximum of 12 participants, and start promptly at 3:00 PM. Please allow a minimum of 1 hour for your visit. Sophisticated, single New Yorker Izzy Grossman (Amy Irving) has left behind the “old ways” of her Jewish heritage. Working at a Manhattan bookshop organizing prestigious author readings, she revels in the society of the literati. Her Upper West Side life clashes with her Lower East Side upbringing, however, when her grandmother (Reizl Bozyk) enlists a matchmaker to set her up with the man who runs the pickle shop, Sam Posner (Peter Riegert). Crossing Delancey not only portrays the tension between modernity and tradition, but also paints a rich picture of New York’s diverse splendor in the late 1980s. Monday, January 7, 2019 at 8:00 p.m. The best in stand-up comedy! A trio of hot comics entertain adult audience members in an intimate theater/night-club setting with both table and tiered seating. Don’t miss your chance to laugh yourself silly in the area’s most popular and longest-running Comedy Club. Join FLTA, under our not for profit heading, Finger Lakes Opportunity for Tourism Growth, and Bonn, Dioguardi and Ray, LLP for an informative session on QuickBooks! What: Finger Lakes Opportunity for Tourism Growth wants to help you understand all the details and daily operations that can assist your business with desktop computer QuickBooks operations. This education session is sponsored by Community Bank. Where: Finger Lakes Tourism Alliance (FLTA) office at 309 Lake Street Penn Yan, 14527. When: Tuesday, January 8th from 9 AM to 12 PM – Please know that light refreshments will be provided. Who: Eileen Downs and Joshua Lyons of Bonn, Dioguardi and Ray, LLP will be the presenters. Costs: For partners of FLTA the cost is $10.00. For non-FLTA partners the cost is $15.00. An attendance fee for a second employee from your business is $5 for FLTA partner businesses and $10 for non-FLTA partners. The Finger Lakes Tourism Alliance (FLTA) and Finger Lakes Opportunity for Tourism Growth (FLOTG), together with Rochester accounting firm Bonn, Dioguardi and Ray, LLP will provide an educational session for QuickBooks users, one of a business’ most important software. This seminar will take place Tuesday, January 8th from 9am to 12pm, noon at the Finger Lakes Tourism Alliance Office, located at 309 Lake Street, Penn Yan NY 14527.
setting up a chart of accounts, bank accounts, customers records and more. Eileen Downs and Joshua Lyons from Bonn, Dioguardi and Ray, LLP will lead the seminar. Bonn, Dioguardi and Ray, LLP specializes in full service accounting and financial management. “We know what an impactful tool QuickBooks is and the need for businesses to get very comfortable using this software to run their business every day. We work hard to bring in the most knowledgeable experts in the field to work with our partners and educate them on items that will directly impact our partner business’ day to day operations and business activities,” said FLTA President, Cindy Kimble. 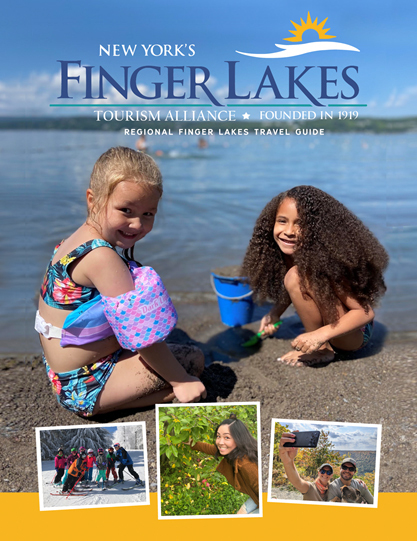 Founded in 1919, Finger Lakes Tourism Alliance is recognized as one of the first destination marketing organizations in the United States. FLTA is an association of private-sector attractions, tourism-related businesses and partnering county tourism offices working together to enhance and promote visitor businesses for the 9,000 square-mile Finger Lakes region of New York State. The Thursday Morning Musicales, founded in 1908, is a unique organization in the Southern Tier because of its long history of promoting music, offering outstanding musicians a chance to perform, and recognizing the abilities of students pursuing musical studies. Join us on Friday, January 11 from 8-10 as Hiroya Tsukamoto takes us on an innovative, impressionistic journey filled with earthy, organic soundscapes that impart a mood of peace and tranquility. Hiroya Tsukamoto is an innovative guitarist and composer who fuses folk, jazz, and world music. Born and raised in Japan, in 2000 he received a scholarship to Berklee College of Music and came to the U.S. Hiroya has been performing internationally including Blue Note in NYC and Japanese National Television. In 2018, he won 2nd place on International Finger Style Guitar Championship. Tsukamoto’s instrumental abilities are indeed breathtaking and astounding, but his performances are so much more than that. He has the unique capability of engaging an audience through a personable and genuine approach that transfixes his audience and almost transcends his capabilities as a guitarist. Audience members will be mesmerized; Tsukamoto plays with an effortless skill on the guitar and a repertoire that will have you traveling the world, not to mention experiencing new sounds with his own compositions. Land ahoy! Bring your crew of buccaneers to the museum for a weekend of pirate-themed activities. Join the Happy Pirates for interactive musical performances on Saturday at 11:30 a.m. and 2 p.m. and Sunday at 2 p.m. Shake fins with a silly shark and check out model ships from the Model Shipwright Guild of Western New York. Visit the pirate play area and walk the plank, create a sea captain hat, dig in kinetic sand for buried treasure, and more. Included with general museum admission fees. The Heritage Village of the Southern Finger Lakes (59 W. Pulteney ST. Corning, NY) will be hosting “Learn to Spin at the Patterson Inn”, on Saturday, January 12 and 19, 2019 from 9:00 am-12:00 pm. The cost is $80 for both sessions. These workshops are designed for beginners and experienced spinners ages 12 and up who want to learn more about spinning. The workshop will help you become familiar with a spinning wheel, how to maintain it and spin fiber into thread. Fiber will be provided for all participants. You are welcome to bring your own spinning wheel to the workshop. Take advantage of this hands-on workshop with two expert spinning instructors. To register or for more information, please call 607 937-5281or send a message to info@HeritageVillageSFL.org. Wings of Eagles is going to Mars! For the month of January, as we make final preparations for the Wings of Eagles Mars Base Eagle exhibit, we will be OPEN TO THE PUBLIC only on SATURDAYS and SUNDAYS 11:00am-3:00pm or by appointment for school/group tours. Inspired by the words and action of Dr. Martin Luther King, Jr., “We Shall Overcome” showcases repertoire from across the African American music traditions that electrified generations of civil rights activists and defenders with interwoven spoken word from Dr. King’s recorded speeches. This production ties together a living lineage of music and culture that includes traditional gospel, modern gospel, classical, jazz, Broadway and spirituals. From Aretha Franklin, to Wynton Marsalis; Duke Ellington to Stevie Wonder; Nina Simone to Donny Hathaway; and traditional spirituals and music from “the Wiz”, Damien’s unique understanding of each genre allows him to fluidly cover so much musical ground in a single performance. ONE NIGHT ONLY! Master Mentalist ERIK DOBELL at Keuka Candy Emporium in Penn Yan! Start the New Year with a Little Magic! Master Mentalist ERIK DOBELL will appear ONE NIGHT ONLY! The Master Mentalist Erik Dobell will be doing a rare public performance in Penn Yan at the Keuka Candy Emporium on Saturday January 12th! Don't hesitate! This is a small venue and you do NOT want to miss this rare performance by one of the nation's top performers of the Magical Arts! Tennessee-based mentalist, magician and master performer Erik Dobell is originally from the Finger Lakes area but performs around the country as a professional entertainer. His past clients included Macy's, Goodyear and the NFL. What can you expect? Erik explains: If you don't know what a Mentalist is, you're not alone. Mentalism is a branch of magic that deals with the mind. So instead of sawing a woman into halves or making a coin vanish, I read minds and perform other feats normally associated with psychic abilities. I'm not psychic but it's going to look and feel as if I am. Although I'm primarily a Mentalist, I also mix a little bit of traditional magic in my performances as well. My goal is to perform strong, unbelievable magic in a fun and whimsical way. Best known as the first hit feature-length “talkie” with a synchronized music score, singing, and speech, this film is also a rarity in early Hollywood—it features a Jewish protagonist. Al Jolson stars as Jakie Rabinowitz, a young man who runs away from his devout family because they reject his desire to perform popular music. He becomes a successful jazz singer under the name Jack Robin, but he longs for reconciliation. It has been argued that Jolson’s controversial performance in blackface—a common practice at the time—symbolizes and complicates the central theme of a Jewish man presenting himself as a white gentile, pointing to the “duplicity and ethnic hybridity within American identity.” The film was nominated for an Oscar for Best Writing at the first Academy Awards in 1929. Bring your friends and let the artist in you uncork while you follow along with instructor Michelle Lynn and paint a pair of wine glasses. January's class will be painting snowflakes. The ticket includes paint instruction, 2 finished painted wine glasses, (1) glass of Heron Hill wine and NYS Cheese. The Rockwell Museum and Corning Museum of Glass, along with the Memory Maker Project, will be teaming up again for the 2018-2019 year to offer the Meet Me at the Museum program, a collaboration with the Alzheimer’s Association. This monthly, interactive tour series is designed specifically for persons with dementia and their care partners, using art and conversation as a catalyst for meaningful connections. This month, join us for an afternoon of discussion and art-making focused on Jaune Quick-To-See-Smith’s collage piece, NDN (for life). We will discuss how Smith layers her artwork with symbols and explores how familiar objects, such as clothing, are filled with meaning about identity. Following our gallery discussion, guests will participate in a collage activity exploring personal symbolism. The afternoon will conclude with light refreshments. Meet Me at the Museum is a free program held on the second Monday of each month; registration is strongly encouraged – please contact the Alzheimer’s Association by calling 800.272.3900. We look forward to making memories with you! Enjoy hand-picked tapas-style entrees paired with local brews from Hamburg Brewing Co.
Hamburg Brewing aims to please with innovative brewing techniques, recipes, and keeping good times rolling. In a film that exults in the tradition of Jewish storytelling, Woody Allen added an extra air of authenticity by casting several revered comics, his own manager, and the owner of the Carnegie Deli as themselves. Danny Rose (Allen) is a dedicated and hapless talent agent who represents a washed-up lounge singer, Lou Canova (Nick Apollo Forte), who is finally making a comeback. Lou convinces Danny to accompany his mistress, Tina Vitale (Mia Farrow), as her beard at an important gig so she can attend without raising the suspicions of his wife. After Tina’s jealous ex-boyfriend mistakes Danny for her real boyfriend, trouble ensues. Roger Ebert praised the performances of the three main actors as “wonderfully off-the-wall characterizations” in one of Woody Allen’s best comedies of errors. Honor the legacy of Dr. Martin Luther King, Jr. Experience popular dances from different cultures from Grupo Cultural Latinos En Rochester, McMahon School of Irish Dance, and the YMCA’s Hip-Hop Dance Troupe. Meet members of the Nazareth College Black Student Union Club, add your handprint to the “Colors of Us” community wall, and more. Please note: Due to the weather, Bright Star Theatre will no longer be performing. Included with general museum admission fees. The Rockwell believes in civic engagement and builds community through partnerships and collaboration by sharing the collection. Our commitment to offering authentic educational and arts experiences to our community steers our work every day. That’s why we’re proud to offer free arts experiences on Martin Luther King Jr. Day this year – including access to the new KIDS ROCKWELL Art Lab. We invite you to spend your day off exploring arts and culture right here in your local community centers. Not too long ago, many Americans assumed that surveillance was something for criminals and spies to worry about, not ordinary people. But it’s fast becoming something that everyone has to confront in their daily life. After all, how do make sense of endless security cameras, TSA scanners, drones in our skies and Big Data analytics? What does it mean when Silicon Valley executives announce that “privacy is dead”? How should we feel about the fact that powerful surveillance technologies probably know more about our intimate lives than our friends and family? While law professors, philosophers, and other scholars have tried to answer these important questions, some of the most interesting responses have come from contemporary visual artists. Banksy and many lesser known street artists have mocked the authoritarian nature of CCTV cameras with brilliant populist commentary. Artist and geographer Trevor Paglen has been searching for the so-called “Blank Spots on the Map” that reveal what governments hide from their citizens, even as it increases its scrutiny of our private lives. And photographers such as Arne Svenson have taken surreptitious images of people sleeping in high rise apartments without their knowledge. Although it’s not illegal to look into windows in New York City, what about when you’re making a photograph that will be widely viewed in galleries and online? What are the ethics of making art in the age of ubiquitous surveillance? This lecture will explore such questions from a broad, humanistic perspective. Nestled between Nine Mile Creek and a wooded hillside near Camillus, New York is the Camillus Erie Canal Park. The park was founded in 1972 by Elizabeth and Dr. David Beebe, whose dedication to Canal heritage preserved a stretch of the 19th century Erie Canal and its Nine Mile Creek aqueduct, We're proud to host Liz and Dave as the first speakers in the Peggy Lou Feldmeier Lunchtime Lecture Series at the Museum. They will discuss current activities at this historic location and talk about their many achievements at the site, including restoration of the aqueduct. The program will take place at the Museum, 318 Erie Boulevard East, downtown Syracuse. Admission is $5 for the general public, and there is no charge for Erie Canal Museum members. You can purchase tickets here. The lecture will include time for questions, and free parking is available in Museum-designated spots in the lot across the street under routes 81 and 690. Email outreach@eriecanalmuseum.org if you have any questions. We look forward to seeing you at this fascinating presentation! Pasta Night returns to Veraisons Restaurant at Glenora Wine Cellars on January 10th, 2019! Every Thursday through April 25th, local celebrities will serve fresh custom-made pasta dishes from a selection of homemade sauces, meats, fresh vegetables, garlic and herbs from 5:00-8:00pm. Enjoy a salad, bread and unlimited trips to the pasta station for only $19.95, with a portion of the proceeds each evening donated to a local charity! Reservations are strongly suggested. Reserve online at www.glenora.com/Reservations or call 800.243.5513. Please note: Pasta Night will not be offered on February 14th. 3/14: Live Like Liz, Inc.
* Schedule subject to change so please call ahead and make reservations. There’s never been a better time to experience CHICAGO, Broadway’s razzle-dazzle smash. This triumphant hit musical is the recipient of six Tony Awards®, two Olivier Awards, a Grammy®, thousands of standing ovations and now the #1 longestrunning American Musical in Broadway history. CHICAGO has everything that makes Broadway great: a universal tale of fame, fortune and all that jazz; one show-stopping song after another; and the most astonishing dancing you’ve ever seen. Whether you’re looking for your first Broadway musical, whether you’ve seen the Academy Award® winning film and want to experience the show live on stage or whether you’ve seen it before and want to recapture the magic, CHICAGO always delivers! Through his writings, curatorial practice, teaching, photographs, and photobooks, Nathan Lyons (1930-2016) had a tremendous impact on the history and practice of photography for more than sixty years. His work as a writer and curator has been widely celebrated, but his own art is less well known, despite its formal acuity and conceptual rigor. Nathan Lyons: In Pursuit of Magic demonstrates that he practiced what he preached—not only in the black-and-white images he sequenced and reproduced in his photobooks, but also in his final body of work. These last photographs, created in the decade before he died, are color images made with a digital camera and presented as inkjet prints. This exhibition represents the public’s first opportunity to see that work in tandem with selected photographs from his earlier bodies of work. One of the primary features of Lyons’s work is his use of juxtapositions and sequencing as a core tenet of visual language, and he strongly believed in visual literacy as the key to navigating modern social life. His color work brings his vision full circle, providing a platform for discussion about the overwhelming presence of images and advertising in contemporary life. Nathan Lyons: In Pursuit of Magic details his vision and demonstrates its relevance for a new, visually sophisticated audience. With a new year comes 365 new opportunities to travel, try new things, and make the most of every moment. The Seneca Lake Wine Trail wants to help you experience life to the fullest in 2019. First up, join us for Savory World of Seneca, a unique wine and food pairing experience January 25 - 27, 2019. This event brings international flair to the wineries along the Seneca Lake Wine Trail. Each participating winery will prepare a delicious, internationally-themed dish to pair with one of their fantastic wines. Sample dishes include Hungarian Goulash, Spanikopita, and Korean Beef. From sweet to savory, whether you’re a passionate foodie or a wine and food pairing novice, you will find this event has just the taste for you! The bonus? Many wineries also decorate their tasting rooms to fit the country and theme of their recipe – a fun, festive experience awaits! Tickets are $40 per person and as always, there is a designated driver ticket available for $30. To learn more and purchase tickets visit www.senecalakewine.com and be sure to use the code FLTA to receive $5 off each ticket purchased! The George Eastman Museum has invited Nate Larson (American, b. 1978) and Marni Shindelman (American, b. 1977) to create a body of work specific to Rochester, New York. The artists, who work collectively as Larson Shindelman, are known for their series Geolocation, which transforms ephemeral bits of data into photographs and immersive installations. In this series, they use publicly available GPS information embedded in social media to track the location of user posts and then travel to the location to create a photograph that both marks the physical place and reacts to the content of the original post. Their work prompts discussions about social media, public and private information, and social issues surrounding race relations, gun violence, and the right to protest. For this exhibition, Larson Shindelman have addedd to their Geolocation photographs by drawing from trending hashtags in Rochester to identify themes relevant to the community. They visited Rochester in the summer of 2018, creating the new body of work that will be displayed. This new work furthers their examination of how smartphones have contributed to a new era of social justice, including citizen journalism, information sharing, and community protest by exploring themes of racial discrimination, violence, right to protest, gun violence, police relations, political activism, and other social concerns. Generously supported by the Rubens Family Foundation. Every Friday at Veraisons from January 11th to April 26th, enjoy a beer-battered fish fry with rice pilaf and seasonal vegetables from 5:00-9:00pm. Add a glass or a flight of local beer, cider, or wine for only $5 more! Gluten free fish fry available. Reservations are strongly suggested. Reserve online at www.glenora.com/Reservations or call 800.243.5513. Please note: Fish Fry will not be offered on February 15th. Join us in Grill 1-2-5 for a wine and food pairings featuring Chateau Lafayette wine selections. In typical Finger Lakes love story fashion, Chateau Lafayette Reneau was born from an admiration for the area, a wine collection, and a taste for the finer things. Bill Engvall is a Grammy nominated, multi-platinum selling recording artist and one of the top comedians in the country. You've seen him on The Bill Engvall Show, as part of the enormously successful Blue Collar Comedy concert films, the WB’s hit sketch comedy show Blue Collar TV and in several solo specials for Comedy Central. In 2012 he reunited with Jeff Foxworthy and Larry the Cable Guy on the Them Idiots Whirled Tour. Bill’s first album, Here’s Your Sign, is certified platinum and held the #1 position on the Billboard Comedy Chart for 15 straight weeks. His second album, Dorkfish, also debuted at #1 on Billboard’s Comedy Chart, as did his subsequent comedy albums. Bill has written several books, including his 2007 autobiography Bill Engvall –Just A Guy. Explore the majesty of castles. Build a giant fortress using Builder Blox or cardboard Archiquest blocks. Create a paper castle and personalize it with doors, windows, and flags. Act out an adventure using puppets and catapult foam balls at a dragon to save the day. Visit the museum’s Build, Drive, Go exhibit to create soaring towers with king-size blocks. Included with general museum admission fees. Join us for Winter Fest at the Beachcomber on Saturday, January 26th! We'll be opening for a day of games and our annual Soup Contest - no registration necessary, just bring your soup in a crockpot to enter! Beat the winter blues and bring your a-game for a chance to win prizes and bragging rights. Did you get engaged over the holidays?! The Holiday Inn Elmira would like to welcome you to tour our facility and to discuss the many details of planning your big day. Our skilled staff is accustomed to pampering clientele and working with you on every detail to help make your special day complete; including showers, rehearsal dinners, and accommodations. Book your event with us between now and January 27, 2019 at 3:00 p.m. to be entered for a chance to win a Champagne Toast for your wedding! Please RSVP to Amy Clarkson for the Preview at 607-734-0402 or restaurant-hinn@stny.rr.com. Join us for our 11th Annual Bridal Show on Sunday, January 27th from 12:00pm to 3:00pm at the Inn at Glenora Wine Cellars! Enjoy complimentary sparkling wine and hors d’oeuvres, tours of our luxury Inn and Cottage, a strolling bridal fashion show and a plethora of fantastic vendors from florists and cake vendors to photographers and DJ’s! Admission is free to the public. Couples are encouraged to pre-register at glenora.com. Ticket Prices: $25 advanced, $30 day of show. Can be purchased online, in person at the State Theatre Box Office, or by calling TICKETFLY at (877)987-6487. Tickets are NOT available for purchase at the Hangar Theatre, except for night-of-show. Nate Larson and Marni Shindelman and George Eastman Museum associate curator Jamie M. Allen will have a conversation about the exhibition #LarsonShindelman #Mobilize as well as the artists’ project working with youth from the Out Alliance. Free to members, $10 general, and $5 students. #LarsonShindelman #Mobilize is the culmination of new work by the artists, who work collectively as Larson Shindelman. The photographs are an extension of their ongoing series Geolocation, which in which they use data to create photographs and immersive installations related to social issues relevant in cities across the United States. Larson Shindelman traveled to Rochester in July 2018 to create new work for Geolocation. Working with the DOLLY (Digital OnLine Life and You) Project, a research lab at the University of Kentucky, Larson Shindelman were able to source publicly available data from Twitter that showed trends in the use of specific hashtags, such as #BlackLivesMatter, in Rochester. They used the GPS information embedded in the social media posts to return to the sites where these public statements were made. They then documented each location with photographs. After carefully editing and selecting one picture to represent each location, they digitally added the text from the original tweets to the image. These works examine how smartphones have contributed to new ways of expressing oneself in public and a new era of social justice. The exhibition also includes an installation consisting of photographs the artists selected from public Twitter, Instagram, and Tumblr posts tagged with #IfTheyGunnedMeDown. This hashtag began trending just after Michael Brown was killed in Ferguson, Missouri, in 2014. #LarsonShindelman #Mobilize is generously supported by the Rubens Family Foundation. The George Eastman Museum has invited Nate Larson (American, b. 1978) and Marni Shindelman (American, b. 1977) to create a body of work specific to Rochester, New York. Through his writings, curatorial practice, teaching, photographs, and photobooks, Nathan Lyons (1930-2016) had a tremendous impact on the history and practice of photography for more than sixty years. Marvel at more than 150 orchids on display in Dancing Wings Butterfly Garden. See guest artist Philippe Nigro during live, narrated demonstrations in the Amphitheater Hot Shop April 22 through 26 from 10 am to 4 pm. 21 and Over Drink. Eat. Garden Repeat. Get a head start on your herb garden. Collect the potted herbs and veggies featured in all 14 food samples along with the matching recipe collection. We kick off every weekend with our Friday Nite Pizza party featuring the choice of 3 gourmet pizzas in addition to the Crystal Lake Café's regular menu and music by a great local band! Premium Tastings at Buttonwood Grove - New Vintages! Blue skies and sunny afternoons on the deck - spring is here!